Tony Prieto had us wash our brushes until the water ran clear. When we bent back the bristles to the heel, there would be no remaining color. I remember standing at the sink washing rollers and brushes after painting panels. We were installing a new exhibit at Mills College. 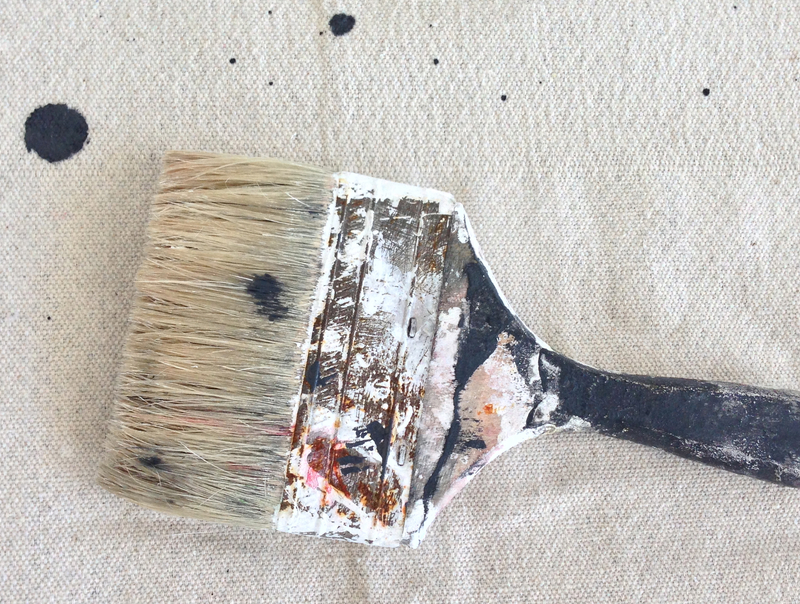 Yesterday I washed my brush after priming a raw cotton duck canvas. This entry was posted in Abstract Painting, Iphone photographs, Paintings, Photographs and tagged Abstract Art, artist's canvas, Mills College, paint brush, Painting, photography, Tony Prieto, Visual Arts. Bookmark the permalink. This brush has been with me since college! It has many stories to tell. Thanks. I looked at my brush with new eyes. Btw., have you seen the documentary “Tim’s Vermeer”? I found it by coincidence this weekend, but it was really interesting about how Vermeer might have used some optical equipment to make his paintings. Thank you – done with my trusty iphone – amazing little camera.Yes Tim’s Vermeer was interesting. A few months ago I saw An exhibit of Hockney’s work. He had his time line there showing his research on the camera obscura. fascinating. Wow, I found a BBC documentary with him – this is huge. So Caravaggio, Vermeer, Rembrandt, even Da Vinci simply copied? It feels like a scam! It’s the only way. Love the shot, Carla. Our teacher used to make us clean brushes with baby oil (after oil painting). We had beautiful soft hands. Carla, Hockney has a DVD called Secret Knowledge on camera obscura you mentioned -great show. I love the prep, good luck with the exhibition. Thanks for the tip. The exhibition was many years ago. I’m just preparing a canvas here. BTW I highly recommend a book titled Man with a Blue Scarf On Sitting for a Portrait by Lucian Freud Martin Guyford. It’s all about painting. © Carla Saunders and Carla's Blog, 2015. Unauthorized use and/or duplication of this material without express and written permission from this blog’s author and/or owner is strictly prohibited. Excerpts and links may be used, provided that full and clear credit is given to Carla Saunders and Carla's Blog with appropriate and specific direction to the original content.